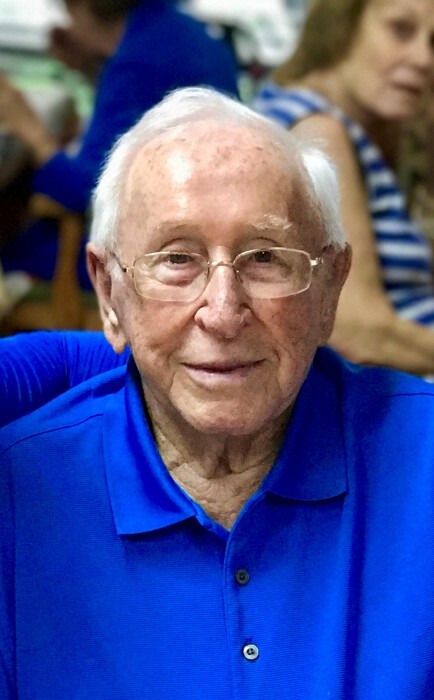 Mr. John Cleveland Brendle Jr., 100, of Winston-Salem, passed away on Sunday, April 14, 2019, at Forsyth Medical Center. He was born on April 15, 1918, in Winston Salem to Nannie Masten Brendle and John Cleveland Brendle Sr. Mr. Brendle was a graduate of R.J. Reynolds High School and a veteran who served in the U.S. Army during World War II from April 9th, 1941, to August 8th, 1945. He retired from Southern Railroad as an Engineer in 1979, and was a charter member of Wesley Memorial United Methodist Church. In Addition to his parents he was preceded in death by his loving wife, Margaret McAbee Brendle; one daughter, Beverly Brendle Jones; and six siblings. Surviving are one grandson and granddaughter-in-law, Hunter and Megan Jones of Lewisville; one son-in-law and wife, Hamilton H. Jones and Dolores Jones of Bluefield, WV; two great granddaughters, Emma Dare Jones and Caroline Lynn Jones; one sister-in-law, Nancy M. Penry of Advance; and a number of nieces and nephews. A memorial service will be held at 11:30am on Thursday, April 18, 2019, at Wesley Memorial United Methodist Church with Pastor Angel Christ officiating. A private family inurnment will take place following the service. The family will receive friends from 5-7pm on Wednesday, April 17, 2019, at Hayworth-Miller Silas Creek Chapel. In lieu of flowers, memorials may be made to The American Cancer Society in memory of Beverly Brendle Jones, 4A Oak Brand Drive, Greensboro, NC 27407.